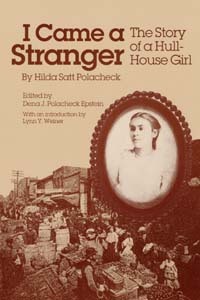 I just finished reading I Came a Stranger: The Story of a Hull-House Girl, by Hilda Satt Polacheck, and edited by her daughter, Dena J. Polacheck Epstein (University of Illinois Press, 1991). It’s a fascinating account of Polacheck’s journey from Wloclawek, Poland to Chicago, and the role that Jane Addams of Hull House played in her life. The book is interesting on many levels: Hilda’s life is filled with many compelling, poignant, and humorous stories; she makes the immigrant experience in late-19th, early 20th century Chicago come alive; and she shows what Hull House meant to a girl like her, who “came a stranger” to Chicago, knowing no English and learning to survive by doing. The labor and feminist politics of the era have immediate meaning for her, and she recounts stories about Emma Goldman, Eugene V. Debs, Clarence Darrow, Alice Hamilton, and other great figures of that time. She describes her struggles, romance, triumphs, and tragedies. This entry was posted in Cape Cod and tagged Chicago, community, history, Illinois, literature, politics. Bookmark the permalink. Gald you enjoyed my Grandmother’s autobiography. Of her numerous grandchildren 3 remain in the Chicago area. For more info about Hilda (Hinda) see the Encyclopedia of Chicago.